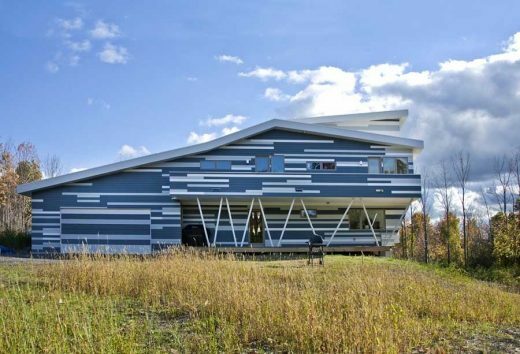 The Hsu House is a small home designed using passive solar principles to create an inexpensive, ecologically sensitive, energy efficient dwelling for a growing young family. Rising out of a hillside south of Ithaca in upstate New York, the bifurcating roof covers a house organized around a three story main living space which functions as both a spatial nexus and a natural ventilation stack. The volume is divided by an interior south facing cast-in-place concrete heat sink mass wall, which stores energy and animates light, creating an all season solarium that, in the summer, opens and unfolds into the natural landscape. 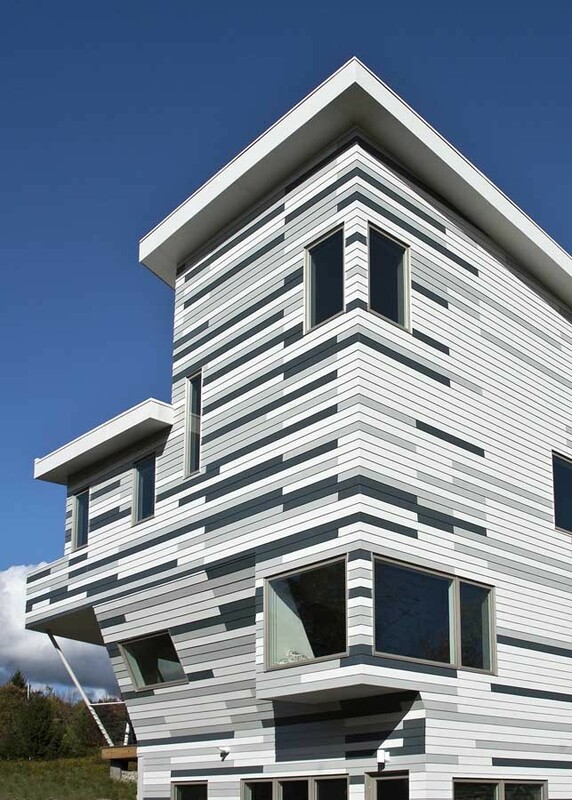 The exterior surface of this New York State residence features solar-responsive cement board siding pattern that transitions from dark to light according to its orientation. From the outset, the intention was to minimize the cost of finishes and fixtures and spend the budget on structure and systems. Consequently, the material palette is simple (bamboo, drywall, cement board & concrete) while the forms and spaces are more complex. 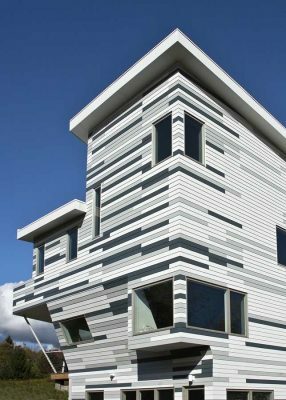 Designed to meet (at minimum) LEED for Homes silver guidelines, the house is super-insulated and was carefully designed in an iterative process using thermal and daylight simulation software to balance daylighting and thermal performance. 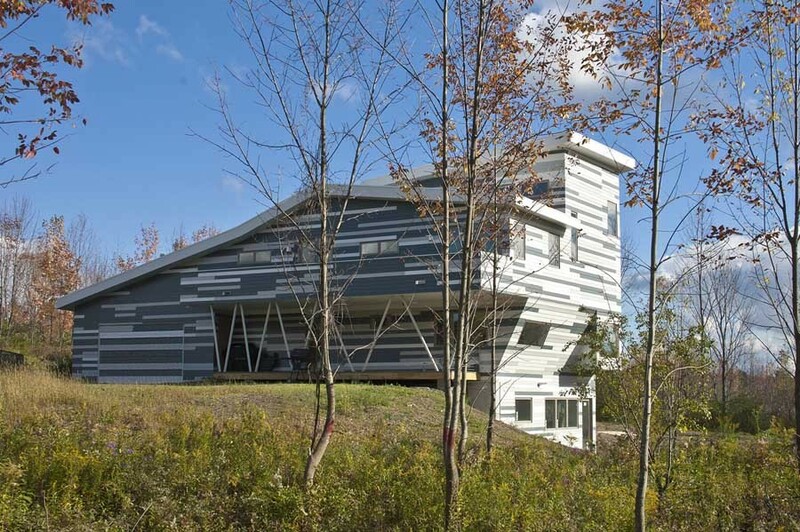 The relatively harsh climate in upstate New York precludes large areas of fenestration, and yet, with less than 30 percent of the total envelope glazed, the house is well lit at all times when the sun is above the horizon. All of the opaque walls contain at least six inches of open cell polyurethane insulation and another two inches of rigid polyisocynaurate underneath the cement board cladding. The house also incorporates a rainwater collection system, a high efficiency forced air heating with HEPA filtered heat recovery ventilation, a TPO high albedo membrane roofing system, energy star lighting and appliances, and high efficiency plumbing fixtures. Particular attention was paid to the detailing of the exterior envelope, resulting in an extremely tight building that, as evidenced by blower door testing, has an extremely low air infiltration rate. Designed to be naturally ventilated, the house has no cooling systems. LEED certification of the Hsu House is currently pending. The house was originally designed to incorporate a custom thermosymponic solar thermal heating device on the south façade; this feature will be installed in the summer of 2011 and should further reduce energy use and carbon footprint. 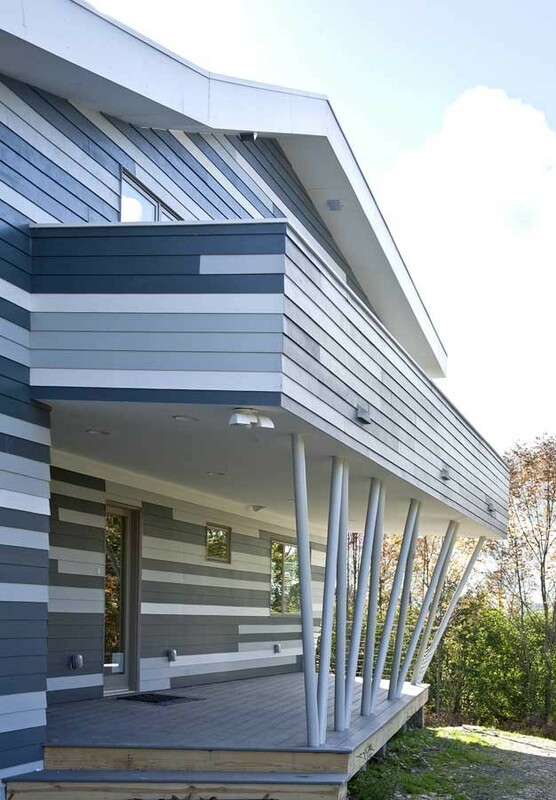 Given that the house was designed to be built with lightweight materials (the cantilevering structure is primarily engineered wood), a mass wall dividing the solarium from the main space of the house was considered necessary to damp diurnal energy fluxes and store absorbed solar radiation. The mass wall is 23 feet long, 14 feet high; its width varies from 5.5 to 16 inches. It was designed with three primary criteria in mind. First, wall surface area was maximized to increase the rate of thermal transfer between the sun, the wall, and the interior environment. Second, the shape was designed to allow light from the solarium to pass through the structure, allowing illumination of the north side of the first floor of the house. Third, the mass wall was designed as the sculptural focus of the house, defining the entryway, the kitchen, the solarium, and the edge of the triple height main living space. A large number of parametric iterations were tested in relation to performance, aesthetics and fabrication constraints. The primary concern was maintaining a level of porosity that would create a sense of lightness, allowing for views through the wall and to counteract the tendency of the concrete to read as a massive and unwelcome subdividing element in what is, after all, a fairly compact and spatially diverse living space. The mass wall was parametrically modeled using Grasshopper, and numerous iterations were tested in numerical simulation. Once a final design was arrived at, guides were cut using a CNC milling device. The more than 100 guides were then use to hand cut a high density polystyrene formliner that allowed for the wall to be completed in a single three hour concrete pour. Structural Engineer: Gary Bush P.E.